Solve problems and guide your fate with divination products including tarot decks, scrying mirrors, pendulums, runes and more. 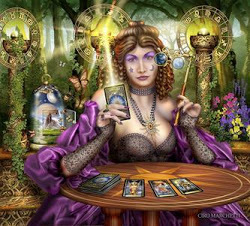 Divination is the art of using your intuition to guide your future. Tools for the ancient art of diviniation includes tarot cards, pendulums, runes, crystal balls, scrying mirrors, tea leaves, and oujia boards. These systems often deemed magic or witchcraft are really ways of putting you in touch with your own inner guide to solve problems or guide your fate. Popularly called fortune telling, divinition can reveal far more than your fortune as you learn how to use and trust your intuition. Open your inner eye and let your subconcious guide you thru the art of divination. You may also want to explore our selection of books on divination for more information and to learn other ways to use the tools in this section.